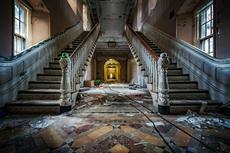 It’s hard to believe that there are abandoned places in this world considering its population is over 7 billion people. But they exist, and if they could talk, they’d tell incredible stories. Exploring long-untouched places in a way that was not meant to be is thrilling. You can learn about the history and feel the story behind it. You will be intrigued by the unusual exteriors and maybe even spooked by the present state of the following structures. If there is one thing cities, towns and villages of all sizes and cultures have in common it is people. When they are missing – whether you know the reason why or not – a place feels scary and it sends bad vibes. Your only companions in certain spots will be ghosts, if you believe in them. Some places have been left due to forces of nature, war, radiation or other biological hazards. Is the reason why they are now uninhabited what attracts people’s attention? Perhaps it’s the challenge to imagine how former residents lived in the middle of the desert without many modern comforts? The way some eerie places allow visitors to engage their imagination is fascinating.